Ok, Ok, you’re right. It’s a new toy and I wanted to show it off. You’re absolutely right. But I learned some things and can do better on my next wire antenna. So, take this as a sales pitch or a gee-golly-wiz piece or whatever. But I learned some things and, to help me remember them, I’m gonna write it all out. So, here goes. 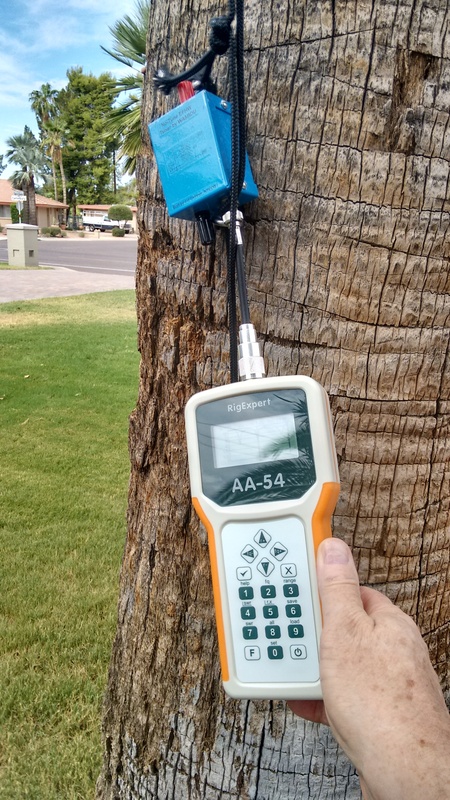 First, the new toy is a Rig Expert AA-54 Antenna Analyzer , seen here connected to the toroidal matching transformer in the blue box, and next to the trunk of the 55′ palm tree and black pull cord by which everything gets run up. Using the analyzer, I explored the 20M wire antenna system I’ve been using on the air — notice, please, the emphasis on system. Everything interacts and while you can isolate, measure and tweak each component, ultimately you use it in toto. The analyzer will help with each step of that process. Here’s the schematic — click the image for a bigger picture. The radiating element consisting of a 33′ vertical wire (up the palm tree to the 45′ level) with four 16′ wire radials pulled out horizontally about 10′ off the ground. (Not shown) – The “ground” for everything connects to our copper 1″ water line from the municipal supply here in Phoenix Arizona. The Toroidal transformer is an 8:1 design by WA5BDU, assembled and boxed by myself, and it seems to do a reasonable job of matching the 50 ohm feed line to the high-Z end of the half-wave vertical. You’ll find it described near the end of this link. Also, I did a previous write-up on my overall “kit”, including this toroidal transformer, for the wire antenna I am using. 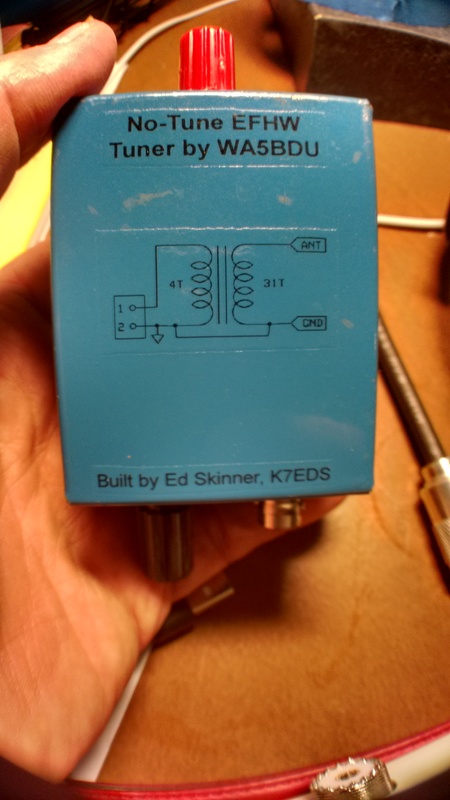 From that kit, this antenna uses one of the 33′ wires and four of the 16′ wires as well as the transformer. Note that, other than rough estimation of wire lengths, no tuning or other trimming has been done to any of the wires. As measured by the AA-54 analyzer at point C, input to the toroid (with coax disconnected), the system is resonant at 12.6 MHz — much lower than expected (20M band spans 14.0 to 14.350) — with a minimum SWR or 2.7 (at the resonant frequency). Without the additional matching provided by, in this case, the YT-100 next to the rig, this antenna system would not be very effective. My goal with the analyzer was to develop a picture of how each element contributed to the overall system. This would include the radiant elements, the toroidal transformer at the feed point, the long coax between rig and toroid, and the antenna coupler at the rig’s output. But isolating, terminating and then measuring each element was more than I could do with the equipment at hand so I elected to take a tinker toy approach. I would start at the rig (point A in the schematic) and “look outward” toward the antenna, and then I would move the analyzer farther out, disconnecting the pieces behind me and ending at point D with just the radiant elements of the vertical wire and four radials. I set the analyzer to graph the SWR readings from DC to 40 MHz. 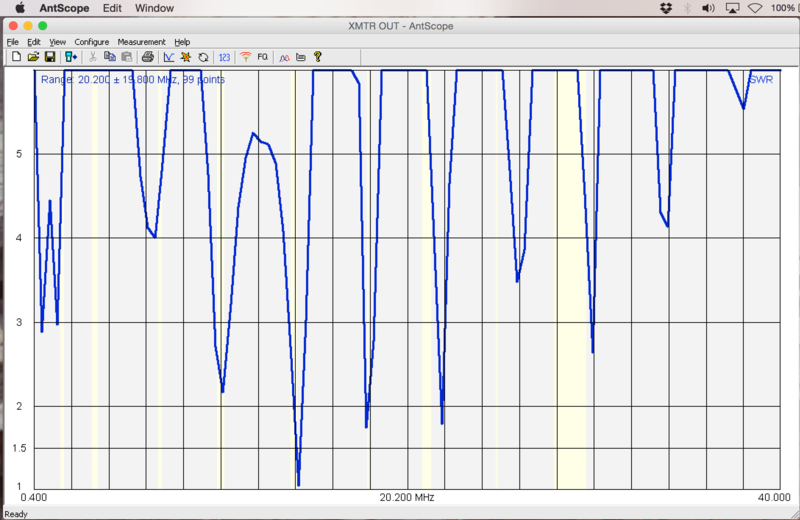 The first of those graphs, the one taken at the rigs output (point A), is this after Save on the AA-54 and then transferring it via USB into my computer. It is important to add that the YT-100 matching network had previously been tuned for minimum SWR at 14.250 MHz. The deepest notch in this scan, however, occurs at 14.345 MHz. 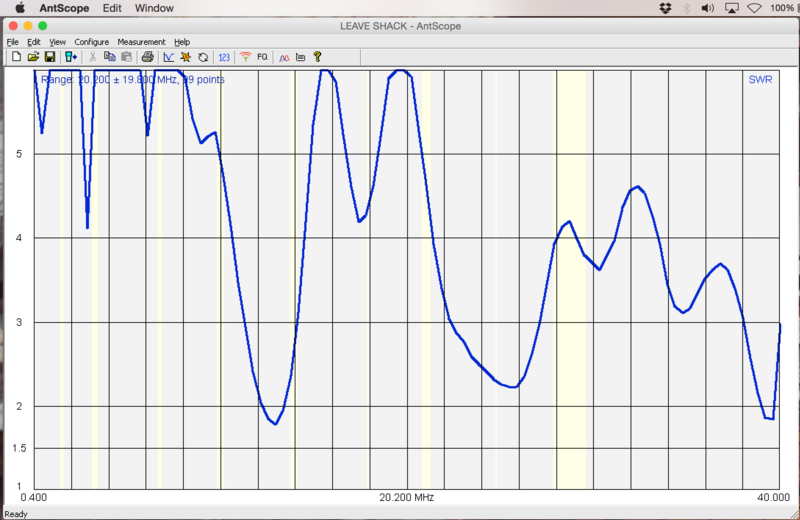 You can eyeball the graph and see that it’s slightly above 14 MHz. But for an exact answer, I did multiple scans (plots) near the dip’s frequency using successively narrower and narrower increments until the “lowest possible SWR” point was determined with a reasonable degree of accuracy. I ran at least half a dozen plots for this with the AA-54 and it took only a couple of minutes, most of that while I learned the controls. Similarly, scanning the entire phone portion of the 20M band, 14.150 to 14.350 MHz, showed an SWR of 1.7 or less. Obviously, the YT-100 is doing a fine job and no tweaking will be needed while working anywhere in that band. But I have to confess that after looking at this plot with all those dips, I was flabbergasted. There’s an SWR “dip” roughly every 2 MHz. What’s going on? So I disconnected the shack-end of the coax and ran another plot. This is the plot at point B. While the SWR no longer exceeds 6 for much of the plot, there’s still that “dip” roughly every 2 MHz. You may also notice that, without the YL-100 tuner in the circuit, the deepest SWR drop is at a lower frequency — it’s now somewhere between 12 and 14 MHz. If you look at the schematic, what this plot shows are the effects of the long coax running from shack to antenna, the toroid at the feed point, and the vertical radiator and the four radials. The resonant frequency of that system is about 12.6 MHz. Hmmm, that’s below the 20M band. Looks like I need to make some adjustments. I moved out to the antenna for the next plot, disconnected the coax from the shack and ran a plot of the system “seeing” only the toroid and wire antenna segments. All the dips every 2 MHz are now gone, or none of them has an SWR of less that 6. Were they all due to the coax, to the various connectors and other impedance “bumps” over that approximately 100′ of RG-8X coax? Looking carefully at that cable, it leaves the YT-100 tuner and goes through a BNC connector and into the wall, coming out to a junction box and another BNC connector attached to the outside wall of the house. The cable then runs to the antenna with the excess bunched in a zero-inductance “back and forth, not round and round” manner. At the toroid end, there’s another BNC connector. So it appears I have many opportunities for impedance “bumps” in that long run, and maybe the toroid transformer is making some sort of contribution, too. I disconnected the vertical and the four radials from the toroid transformer and connected them directly to the AA-54 analyzer and ran another DC to 40 MHz plot. This is point D — antenna wires only. Nothing else. Again, there are three SWR dips much like I saw looking through the toroid transformer. But notice the frequency of the dips. The lowest is now down around 7 MHz. Measured at point C, this was up around 12.6 MHz. Why did the resonant frequency of the system change when I removed the toroid? Well, duh, because it is a reactive component — the toroid transformer changes the resonant frequency of the system! Looking carefully, the three SWR dips are at approximately 7.5, 19.5 and 35.5 MHz. And there’s no dip (to less than an SWR of 6) in the desired 20M band (14-odd MHz). After scratching my head for a while and running some numbers, here’s what I’ve figured out. 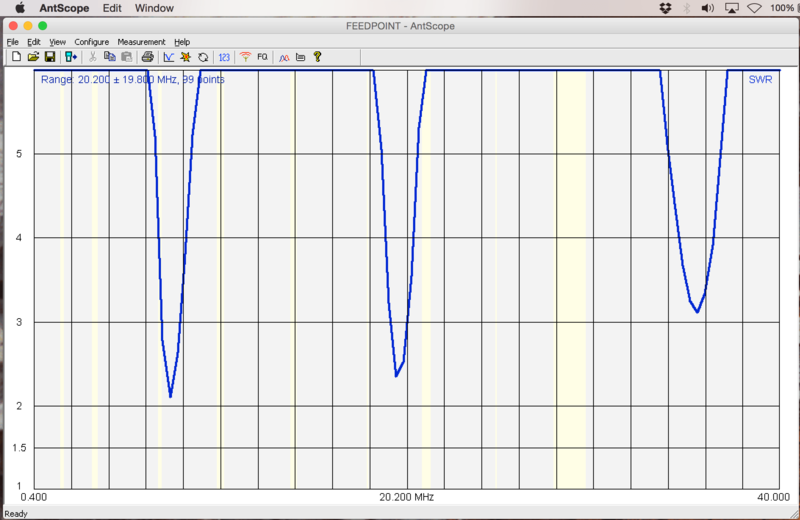 The lowest dip is the frequency at which the 33′ vertical wire would be a quarter wave, at 7.5 MHz. 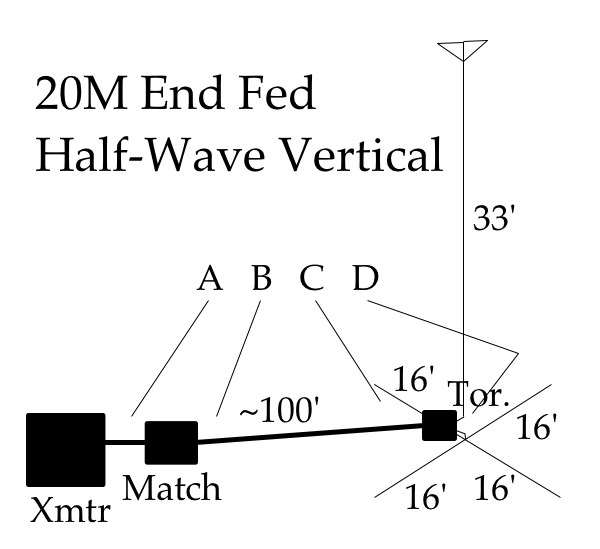 The middle dip at 19.9 MHz would be a full wavelength if you let the 16′ radials drop down to vertical off the tail end of the 33′ vertical. That’d give a total length of 49′. 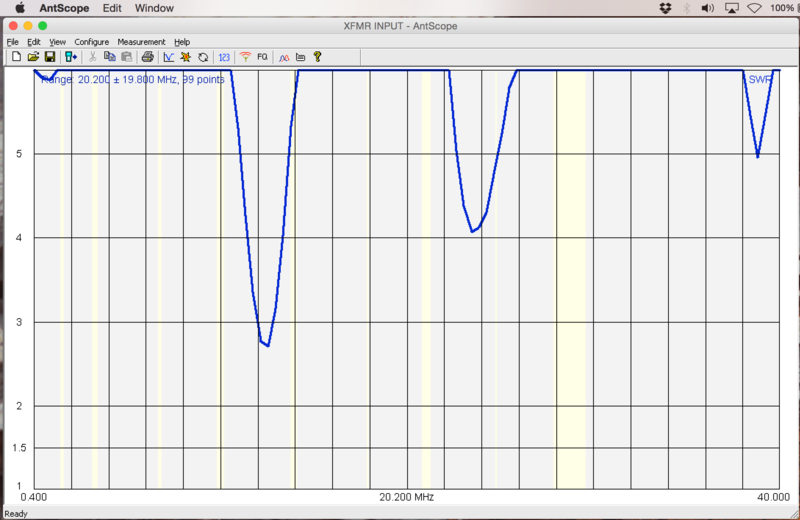 So, at 19.9 MHz the system acts like an off-center fed, full wave antenna. And the 35.5 MHz dip? Okay, I’m stumped on that one. I don’t know what combination of wires and tree trunk and my neighbor’s Chrysler hatchback are combining to make that resonance. But it’s definitely there. The bottom line is that my “one antenna”, all by itself, is resonant to varying degrees at a minimum of three frequencies. And they are not multiples of each other as might be expected. Instead, the various elements of the system take on different roles at different frequencies. What’s important is what I’ve learned for the next time. The antenna system is just that, a complete “system”. While each component can be isolated and measured on its own, what ultimately matters is the net result with everything interacting. Quarter-wave and full-wave elements show up very nicely in the plot. Not so with half-wave elements. While my end-fed half-wave vertical has worked reasonably well (with some degree of “efficiency” — an important property to add into my thinking), the analyzer doesn’t give a lot of help for it. That “approximately 100′” of RG-8X with various connectors and excess length has got to go. So I’m in the process of switching from the convenient BNC connectors to the hopefully less “bumpy” PL-259 and SO-239 types. And I’ll trim the cable to the exact length needed. And I guess I should add that electricity finds new and exciting ways to manifest itself regardless of what I think I know. It’s monsoon season here in Arizona and thunderstorms are forecast for the next several days so I’ve taken the 20M vertical half-wave system down. When the moisture is spent, I’ll change out the connectors and then put something different up in the air. Over in my spare parts box is a never been used 1:1 balun so I think I’ll try a simple dipole. I’ll fly it from the top of the palm tree — the pulley “up there” is a 55′ — and let it slope down at a 45 degree angle via black Dacron cord from the other end and tied to a stake in the ground. I’ll let the coax drop down from the balun and secure it to another stake. The AA-54 analyzer will be involved from the outset. I’ll use it looking through the balun to trim wire lengths for the center of the phone band on 20M. When finished, I’ll either be near 14.250 MHz calling CQ, or in the pile-up for E50A in the South Cook Islands. Either way, I’ll be the one with the best resonating dipole! Very interesting read, Ed. I have been antenna compromised for over 20 years and have tried numerous configurations on 80 through 10 meters. While I have no palm trees, (wish I did) I have a cactus that is growing at a rate of about an inch a year so by next century I may get some decent reception! Presently at about 12 or 13 feet I have to slope the dipole ends downward to about 6 feet and anchor into the perimeter wall. The 80M dipole snakes along the wall and thus is nearly useless. I too use about 100′ RG-8X and PL-239’s. At times I have been successful working semi-rare DX but for the most part I stay stateside mixing it up in weekend contests where I can have a lot of activity in a short period of time. When I lived in PA I had a 5 element tri-bander at 40′ and was doing well but here in AZ the small lot and HOA restrictions changed everything. I hope you’re recovering well and maybe I’ll see you at the range when the weather is a bit cooler!